The Fitbit Charge HR is the first Fitbit with continuous strapless heart rate monitoring. In addition to doing what other Fitbits do (counting steps, distance, calories, floors climbed, and tracking sleep) it uses LED lights on the back of the wristband to take your pulse continuously. Plus, if you pair it with a compatible phone you can get call notifications. It's a very smart pedometer watch. If you are interested in the Charge HR, you may prefer the Fitbit Charge 2, which includes the heart rate feature but is an updated version with easily interchangeable bands. It also can display your speed and distance when linked to your phone's GPS, which the Charge HR does not do. The Charge 2 has vibrating Reminders to Move each hour and a countdown of how many steps you need to get to a mini-goal of 250 steps each hour. The display on the Charge 2 is expanded without adding bulk, making it much more readable and allow you to view full-text message and app notifications. The Charge 2 is a much better value. Who Will Love the Fitbit Charge HR? If you walk, run or exercise regularly and want to push yourself more, the Charge HR will help you ramp up your exercise intensity. By knowing your heart rate during activity and tracking the minutes each day you are in a higher exertion zone, you will be motivated to do more. Best of all, you don't need to take the extra step of putting on a heart rate monitor strap, you're already wearing your monitor on the sleek wristband and it's always tracking your heart rate in addition to steps. The heart rate reading is used to tell you much more about your health, workout and lifestyle activity. Time in Heart Rate Zones: You can't fool yourself that you've been more active than you really have. With the app and online dashboard you get a daily total of minutes in the moderate-intensity Fat Burn zone (50-69% of maximum), in the vigorous-intensity Cardio zone (70-84% of maximum), and the Peak zone (85% and above). Are You In the Zone? The display on the Charge HR is blank unless you tap it or press the button, so you can't just take a swift no-hands glance at it. Activate the display and you see your heart rate. The heart icon next to it is an outline if you are below the fat-burning zone, has two lines above a solid heart when in the fat-burning zone, a line above and below a solid heart when in the cardio zone, and two lines below a solid heart when in the peak zone. Custom Zone: If you want to stay within a custom zone, you can set it in the app or Dashboard so the indicator will show when you are in the zone. Workout Heart Rate: See a graph of your heart rate during workouts, including your average and maximum heart rate. Daily Heart Rate Graph: See a graph of your heart rate throughout the day. Accuracy: I compared the readings with that of a chest strap heart rate monitor during brisk walking and they compared very well. I got stable readings easily and they matched well for moderate intensity exercise. However, several users complained in the Fitbit forums that they had difficulty getting readings they trusted for vigorous exercise, weightlifting, etc. The Charge HR band is made of a flexible elastomer and uses a buckle closure, which is far more secure than the snap closure for the Flex and Charge.The recalled Fitbit Force triggered metal allergies in some wearers, especially around the charging port. The port is recessed on the Charge HR to prevent skin contact, but you do have contact with the metal buckle. You have to wear it snugly against your wrist for the best heart rate reading, but it doesn't have to be tight. You can carry it loose in a pocket and get step data, but you won't get a heart rate reading. The display of the Charge HR is black until you tap it or press the single button. Like the regular Fitbit Charge, it displays the time of day and you can set vibrating alarms. You can choose whether a tap displays the time, step count, distance, heart rate, calories burned or stairs climbed. This is a big improvement over the 5-dot indicator display of the Fitbit Flex. Note that two models we tested had the band start to come loose from the tracker face after a year, which did not speak well for its durability. Is the Fitbit Charge HR Waterproof? No. It's OK to wear it in the rain but they recommend not wearing it in the shower. No bathing or swimming with it, either. Setting Up the Fitbit Charge HR: You need either a computer or a smartphone to set up and use the Fitbit Charge HR. It syncs wirelessly to a USB dongle on a computer, or via Bluetooth 4.0 to the mobile app. Charging and Battery Life: It uses a custom USB cable (different from that used by any other Fitbit) for charging. A charge should last five days and it takes 1-2 hours to recharge. All-Day and Workout Steps: The Charge HR tracks both all-day steps and steps for individual workouts. It vibrates and flashes when you reach your daily step goal, which is set to 10,000 steps per day by default (which you can change). 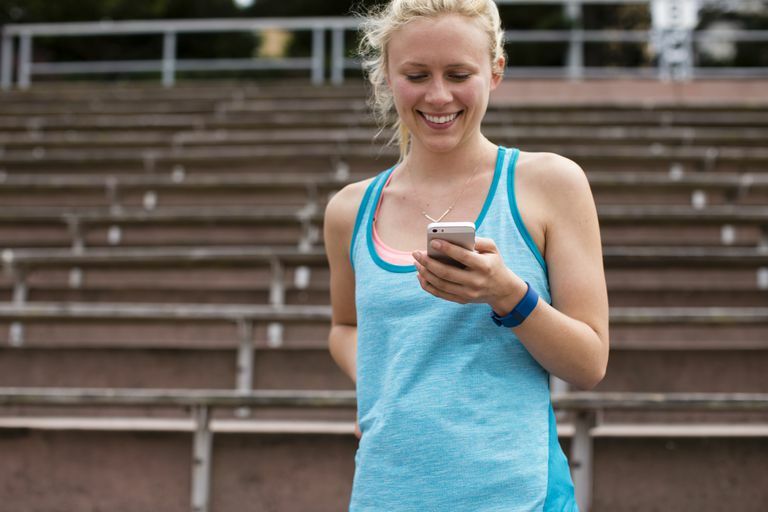 Exercise Tracking: It's easy to track an individual exercise session. Just press the single button on the Charge HR until it vibrates and the stopwatch icon appears. During a workout, you can scroll through elapsed time, current heart rate with zone indicator, calories burned, steps, distance, floors climbed and the time of day. After your workout, sync your data to view details including the time in each heart rate zone, a graph of your heart rate throughout the workout, step, distance, calories burned and active minutes. If you use the mobile app and your smartphone has GPS, you can use the app's Track Exercise function to track speed and distance. Calories: Fitbit tracks all-day calorie burn, plus you can see the calories burned during the workouts you track . The calorie count is meant to help you balance the calories you eat with the calories you burn off all day. The dashboard or app will tell you how many calories you should eat in order to meet a weight loss goal. You can use their food tracking log online or in the app. It is a very good pedometer for dieters. Distance: This is estimated from your step count. Sleep: The Charge HR automatically detects sleep. On the app or dashboard you can view your total time in bed, time asleep, time awake and time restless, plus a sleep graph. Alarms: You can set multiple vibrating alarms and choose how often they repeat. Stairs/Floors: It automatically tracks the floors climbed. Active Time: The number of steps you take per minute are translated into Active minutes. This can help you track whether you are meeting exercise recommendations for 30 minutes or more of moderate-to-vigorous exercise each day. Incoming Call Alerts: If you enable this function, your Charge HR will vibrate and display the caller ID of incoming calls from your mobile phone, if you are within 20 feet of your phone. Fitbit is a favorite of mine for tracking your diet and health stats. You can use its food log in the app or on the online dashboard, track water, your weight and more. You can engage in challenges with friends and earn badges for accomplishments. Fitbit also can share data with many other popular apps and you can post to social media. Comfort: Very comfortable to wear, and the buckle closure is much more secure than the snap closure of the Flex or the Charge. Display: The display is big enough and bright enough for my aging eyes. I love seeing the numbers for my stats on the wristband rather than having to check an app. Heart Rate Data: It's worth the additional cost vs. the Charge to have the continuous heart rate reading. I love knowing if I'm in the fat-burning zone or the cardio zone during my workouts without having to add a chest strap. I love being able to review the graph after my workout in the app or online. This motivates me to do more vigorous workouts and increase the minutes I spend in the higher heart rate zones. Mobility: You can purely use the device and mobile app without needing a computer. You can only view today's data on the Charge HR itself. You need to sync with the app or a computer every 7 days to download minute-by-minute motion data, but it will keep 30 days of daily totals if you are unable to sync weekly. No inactivity alerts or move reminders to keep you from being sedentary and reduce the health risks of sitting too much. The Charge 2 has these features. The Charge HR doesn't have the running watch features that are included in the Fitbit Surge. It doesn't track laps, speed or GPS-based distance (although you can do so with the Fitbit app). While you can track workouts, you can't see your summary immediately on the band itself, you have to sync and view it with the app or online dashboard. You don't get the full features of a dedicated heart rate monitor. You have to activate the display with a tap or pushing the button to see your heart rate and other workout stats. There are no beeps or vibration to indicate if you are in-zone and out-of-zone, just the icons. The Charge HR was a good choice, but unless you are getting a very good deal on closeout, get the Charge 2 instead. You'll appreciate the interchangeable bands and the larger display, plus connecting to your phone's GPS to display speed. If you need something geared more towards workouts and want to stay in the Fitbit line, the Fitbit Surge super watch also tracks heart rate continuously. It includes GPS for speed and distance and for viewing a map of your route in the app and online. It has all of the other basic Fitbit functions for steps, calories and sleeps tracking. The display keeps your numbers visible while you workout and you can use it as a sleek watch the rest of the day.